dev2.0 people doing great trade happier than those chained to charity - SO 1 new mdb banks? 2 how freedoms to trade value planes & boats & trains? 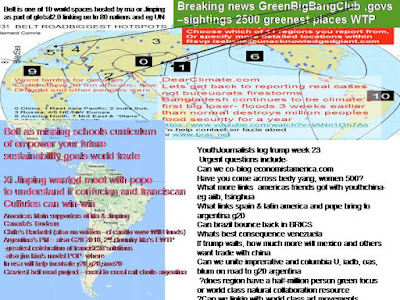 help wanted- contribute to diaries and youth journalism of world record jobs fieldbook of global2.0 summits youth are invited to turn into jobs creating curricula matching goals of sustainability generations-which will be the top 20 www summit formats and how can media be designed so that the peoples diaries interact productively ChinaThanks.com and BeltUSAsia.com feature 11 regions : 0 China, 1 Rest Far Pacific (E&S) Japan main sponsorAlibaba hosts Olympics 2020, 2 India (host aiib 2018 and g20 2019) & Bangla, 3 Russia, 4 East Europe, 5 West Europe (host of G20 2017), 6 N America (host of gateway17) & Stans (host SCO 2017) and middle east (host of greatest open education summits), 8 Med Sea (most urgent refugee conffict space) 9 Africa, 10 S America where Argentina hosts G20 and fatherland of moral cultures leadership Pope Francis and Preferential Option Poor Franciscan civilisations. future of economics - exponential metrics :is system compounding goodwill future? celebrating livelihoods & sustainable human purpose -is there a greater job creating network than the free university movement? Entrepreneurial Revolution 1970 Exercise in exponentials- imagine what humanity can do if computers deliver billion times more analysis capacity > Community & sustainability's Rising Exponentials - as Keynsians first mapped in 1970s, the greatest differences between the scarcity economics of consuming up lifeless things and future economies of millennials compound round how hi-trust networks can mobilise life-critical knowhow which multiplies value in use - joyful economic abundancy way above zero sum models IFrisk analysis is transformed. From 20thQ3- quality Japan (the Korea); diaspora chinese superports; 20thQ4 Bangla end poverty 1.0; and 2.1 from 2000 to 2015 Bangla and Kenya mobile women4empowerment partnerships.. .